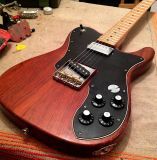 Got a nice older Bach Telecaster Standard, they build many of their guitars with mahogany body, which is interesting for a special Tele Custom build..
the original bridge singlecoil sounds nice, bridge with notched brass saddles..
neck pickup cavity hacked with wood knives..this mahogany body is really light, smells nice and is really dark colored. 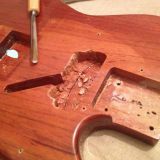 control cavity hacking was most work ( forgot to take fotos)..
fret levelling and recrowning..left some scratches on the maple fretboard because I only covered it with cheap tape..
masking tape is much better..lesson learned. 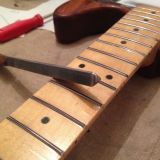 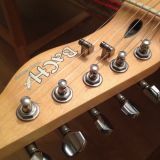 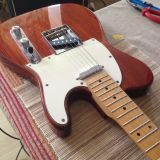 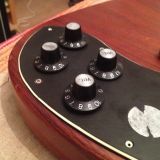 maybe I fix that later..
body through holes look a bit off-centered, so I drilled them a notch wider, so that the strings don�t touch wood anymore..
string trees make a huge difference on the Tele..
neck pickup is a Vanson Alnico II humbucker, wired out of phase, sounds great in middle position..